We are Edmonton’s only independent, volunteer powered campus-community radio station, broadcasting from an old bank vault in the basement of the Students’ Union Building on the University of Alberta campus. CJSR’s mandate is “to enlighten and entertain our audience through high quality and diverse programming that constantly challenges the status quo”. We do this by broadcasting eclectic programming that enriches the lives of U of A students as well as the broader Edmonton community. Broadcasting in 8 different languages we seek to reflect and meet the needs of our diverse community of listeners and donors in and around the Edmonton area. In addition to our wide selection of music programming we also produce a dozen news and spoken word programs to present a side of the story not always found in mainstream media. CJSR has a volunteer base of approximately 300 volunteers, with a staff of 5 to manage and support them all. We are a member-driven organization governed by an elected Board of Directors, representing our members/volunteers. We are a registered charity and are registered provincially as a not for profit organization. We are funded by several streams of income including: levies from U of A undergraduate and graduate students, provincial gaming revenue (AGLC, every 2 years), donations from listeners (annual FunDrive campaign), grants (variable) and advertising revenue (local). You can find a breakdown of our finances here. First Alberta Campus Radio Association (FACRA) is a not-for-profit organization and registered charity that holds the broadcast license for CJSR-FM 88.5. This organization governs the station bylaws and provides oversight to CJSR operations. The FACRA Board consists of up to 12 elected and appointed members, including the requisite 2 SU and 1 GSA representatives. CJSR is nationally recognized for it’s programming! Over the years, our shows and producers have won awards for excellence in programming, national initiatives, and community involvement. CJSR made its first FM broadcast on January 7, 1984—the first song was “You Turn Me On, I’m a Radio” by Joni Mitchell—but its roots stretch to the founding of CKUA in 1927. That station, which was owned by the university until 1944 and whose studios were located at the Power Plant, provided the foundation and infrastructure for the creation of the University of Alberta Student Radio Directorate, the direct progenitor of CJSR. The Radio Directorate, which changed its name to the Radio Society in 1948, broadcast over a closed PA system all over campus, and weathered funding cuts, format changes and a temporary shutdown due to lack of funds. By the ‘70s it had built an AM antenna—that could only broadcast as far as Lister Hall—and gained the call letters CKSR. In 1978 the station was renamed CJSR when a television station in Chilliwack wanted the call sign and the CRTC granted the request. 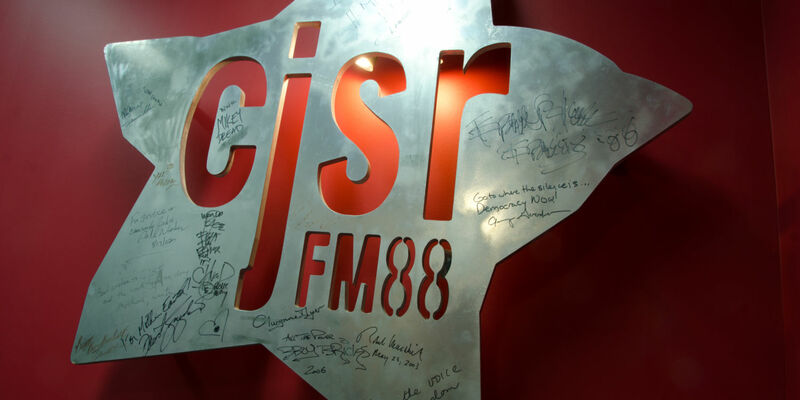 In 1983, after more than a decade of work, CJSR was granted an FM license at 88.5 FM, the furthest left the dial could go, and focused its attention beyond the university campus from where it still broadcasts. For the past 30 years, CJSR has been a voice for diverse communities not represented on radio anywhere else in the city: it broadcasts alternative news, cultural programming and underground music that cannot be heard anywhere else, with a strong focus on local culture. CJSR has also long been a place of inclusion, where people of any age and background can learn the various aspects of broadcasting. From board members, to music librarians, technicians, organizers and on-air hosts, CJSR is proud to be volunteer-run radio dedicated to pushing the status quo. Want to get involved with CJSR? Volunteer or donate to help keep the station on the air!